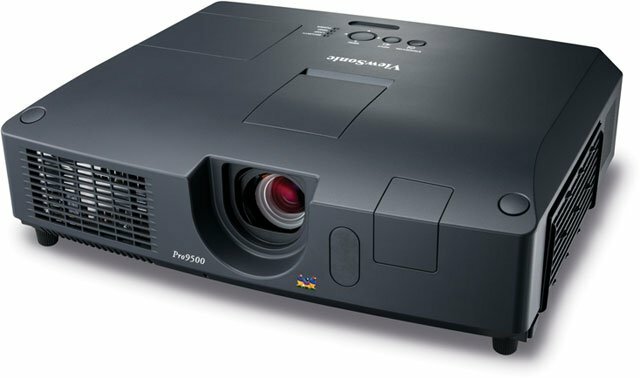 The Pro9500 is an advanced high brightness LCD installation projector which includes 3LCD technology to produce more vibrant colors. The Pro9500 delivers 5000 ANSI lumens, 3500: 1 contrast ratio (active IRIS) with a 1024x768 XGA native resolution, allowing it to shine in virtually any lighting situation. The Pro9500 provides maximum mounting flexibility with a wide 1.7x optical zoom, lens shift, automatic vertical keystone correction, wider throw ratio and advanced connectivity options including network display and USB plug- & -play display. Top load lamp and filter designs provide for easy maintenance.